Lately, I’ve been looking at different ways to add a “something extra” to some of my pieces … so, I’ve been playing with decals and learned that there is definitely a learning curve in working with them. There are several types of decals: those you apply before the bisque fire and those you apply after a piece is glazed and fired. The piece to the left has a decal that was applied before the pot was bisque fired. It’s an underglaze design that’s been printed on a thin piece of rice paper. Directions say to wet the decal and apply it to the piece. I found it easier to brush water on the piece and then lay the decal over it and smooth with a dry brush. It’s easy to smear the decal; so, it’s best to handle it as little as possible and leave it alone to dry. 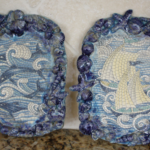 This piece was glazed with a zinc-free clear and fired to cone 5. Decals applied after a piece is glazed present other challenges. The decals have to be soaked until they come loose from their backing paper before applying to the glazed piece. The decal is fragile and can wrinkle or tear. And after the decal is applied, it has to be gently brushed to remove all air bubbles; then, left alone for 24 hours. Finally, the piece with the decal is fired to cone 017. I didn’t realize how much he glaze color can affect the decal. 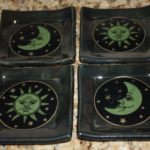 The moon & stars decals (below left) were put onto pieces with a dark blue glaze. Mistake! The moon & stars look green because the decal was yellow; blue & yellow = green. Mistake 2: the middle picture shows decals that get lost with all the fru-fru around the edge. 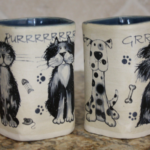 The cats & dogs turned out pretty well. Hooray!! One out of three isn’t bad.